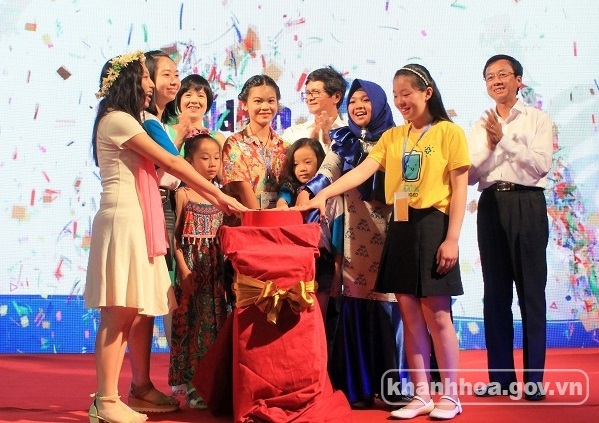 On the evening of May 30th, at Vinpearl Land, Nha Trang city, Vietnam Television (VTV) in collaboration with Khanh Hoa provincial People's Committee and Vingroup Group organized the meeting and exchanges program of international children's groups, officially launched 3rd VTV International Children's Festival in 2018. Mr. Tran Binh Minh - Member of the Central Party Committee, General Director of Vietnam Television; Mr. Nguyen Dac Tai - Member of Standing Committee of Provincial Party Committee, Vice Chairman of Khanh Hoa provincial People's Committee attended. 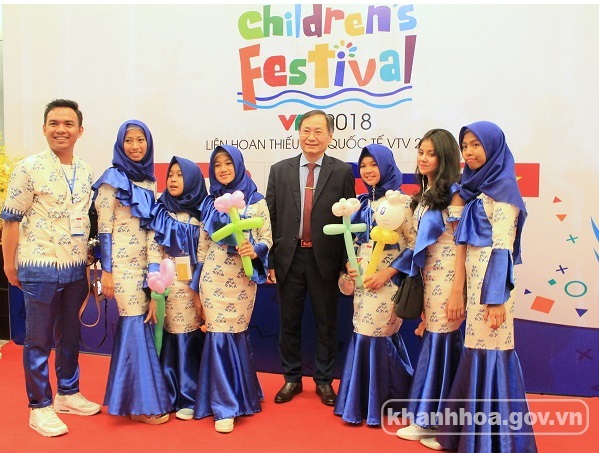 Mr. Nguyen Dac Tai - Member of Standing Committee of Provincial Party Committee, Vice Chairman of Khanh Hoa provincial People's Committee (the fourth from the right) meet the international children groups. This year's VTV International Children's Festival takes place from May 29th to June 3rd with the theme "For a green planet". Participating the festival are children from 8 countries: Thailand, Philippines, Indonesia, Vietnam, Russia, Korea, China and Japan. Each delegation has 8 from 15 members. Vietnam has the largest number of participants with 30 children from the Vinschool Art Troupe. During the five days of the festival, children's groups will participate in a number of key activities such as: visiting aquarium, safaris, water parks and challenging hill; participating in group activities ... Especially, they will participate in 3 television programs: Happy Lunch (live broadcast at 12 am on May 31st on VTV6); Art Gala "Green Earth" (live broadcast at 8:10 PM on June 1st on VTV1); The program "Friendship days" broadcast at 8:10 PM on June 9th on VTV1. Representatives of the Organizing Board and international children's groups perform the ceremony rite to press the launch of the VTV International Children's Festival 2018. This is the annual activity of Vietnam Television on International Children's Day June 1st with the goal of connecting friendship solidarity among nations in the region.